How does one go from being a piano performance major to working with one of the fastest growing companies in the history of SaaS? 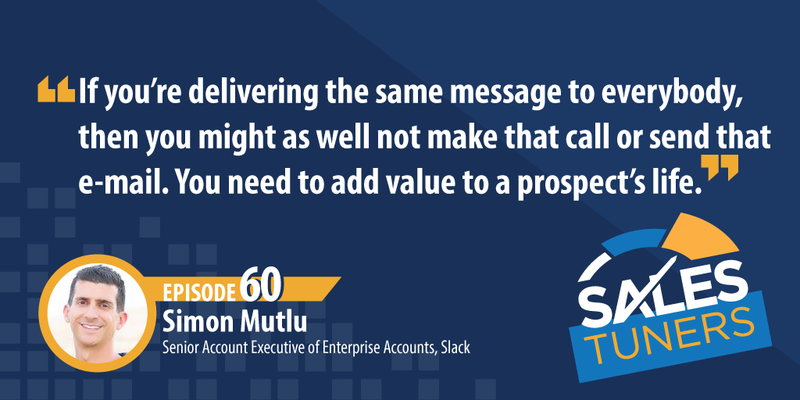 If you’re Simon Mutlu (@SimonMutlu), Senior Account Executive of Enterprise Accounts at Slack, you start by selling knives. Simon started his career selling Cutco cutlery inside of people’s homes. He managed to build a team in San Francisco before joining the gold rush of the internet. He spent the last 15 years building and leading sales organizations for small startups before joining Slack. What sets Simon apart is that he’s more than a salesman; he’s a craftsman. He spends the extra time to go above and beyond what customers would normally expect from someone in sales. Simon has always found a way to be intentional about connecting with customers. He has gone so far as to record a CD of him playing piano holiday music along with a handwritten note to his top customers. At Slack, he’s focused on helping companies change its behaviors to become more productive. The technology he’s delivering is secondary to the organization’s ability to improve and motivate their people. Create Replicable Processes: The best ways I’ve learned to master a concept are to first write it down, and then second is to teach it. Doing both of those naturally forces the ability for the process to be replicable. Once it can be replicated, it can be measured, and once it can be measured, it can be improved. Add Value in Every Outreach: If your calls, emails or social posts aren’t adding value to a prospect’s life, why even do it? Put yourself in there shoes assuming they’re inundated with messages. Figure out how to make your point succinctly with a clear message of implied value. Ask Customers How You Could Have Improved Their Buying Experience: Most companies do some version of NPS surveys or Net Promotor Score to learn what customers think about using their product. But, when was the last time you asked your customers what you could have done differently in the sales process? For a lot of sales reps the only feedback we get is whether we won or lost the deal, which frankly doesn’t help us get better.